Artist Katie Paterson wants people to sculpt thousands of mountains of sand on north coastlines. A new project, combining art with mountain ranges, will visit some of the north and north-east’s most famous coastal locations next summer. First There is a Mountain is the brainchild of Scottish artist, Katie Paterson, and aims to connect the public to the world’s diverse highspots. 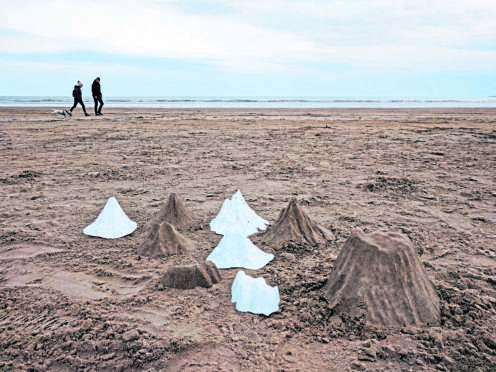 It involves the creation of a set of ‘buckets and spades’ in the form of famous ranges, from which the public will be invited to build mountains of sand across the UK coastline. Every pail is a scale model of five of Earth’s most iconic high places: Mount Kilimanjaro (Africa), Mount Shasta (USA), Mount Fuji (Asia), Stromboli (Europe), and Uluru (Oceania). The venture is being staged in Aberdeen on June 23, then moving on to Orkney, Lewis, North Uist, Skye and Mull during June and July. Participants will sculpt beaches into thousands of mountains of sand to form micro-geologies which will only survive until the tide washes them away. Ms Paterson has exhibited internationally from London to New York, Berlin to Seoul, and her works have been featured at the Hayward Gallery, Tate Britain, the Guggenheim Museum and the Scottish National Gallery of Modern Art. She said: “From early childhood, we understand that sand marks time. “First There is a Mountain builds upon this concept, making us aware of mountain rocks’ erosion over millennia and rock shifting across Earth over continents’ evolution, forming unique fingerprints of sand across our modern coastline. She carefully selected every mountain range via exacting research, using data from NASA’s Shuttle Radar Topography Mission and the National Geospatial-Intelligence Agency. The sand pails are made from 100% fermented plant starch and are fully biodegradable. At the end of the tour, they will be composted and re-absorbed back into the natural environment. The venture is a collaborative project and 25 new pieces of writing have been commissioned to accompany the artwork’s evolution. The texts will form a digital anthology, bringing together celebrated authors, poets, geologists, earth scientists, ecologists, and art writers.